This is the 3rd updated edition of a book which has already sold over 500,000 copies. In addition to many well known favourites, it contains over 130 tried recipes many of which cannot be found in other publications. 130 New Winemaking Recipes supplements the best selling First Steps in Winemaking by C.J.J. 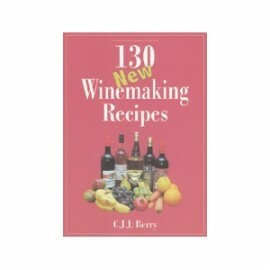 Berry and the two books together present a comprehensive collection of recipes. Paperback Third Edition Reprinted 2006 123 Pages.